Episode 3 for The Walking Dead Season 2 was released this month and it seems to be a tad shorter than previous episodes but it packs quite a punch even though it's half an hour shorter. If this review seems to look similar to the previous episode reviews that's because it is - but what would you expect considering only the plot changes between episodes? 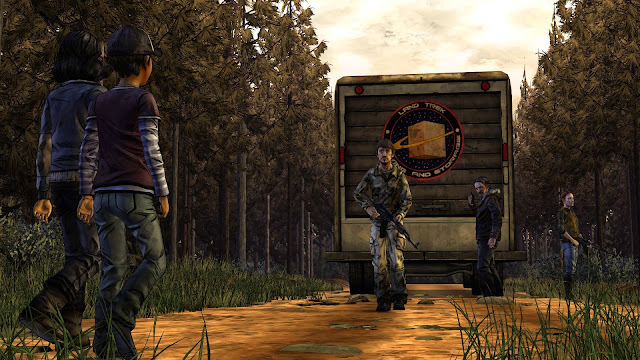 In this episode, Clementine and her group are effectively imprisoned at a large warehouse where another community has setup. Apparently some members of Clementine's current group used to live there but managed to escape. At the community you'll get to meet a whole bunch of new characters to meet including even more from the 400 Days DLC. This episode is definitely one of the darker ones with respect to exploring the human psyche, zombies really taking a back seat until right at the end. 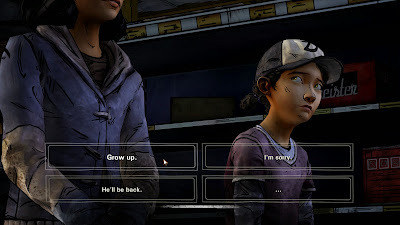 There is one particularly gruesome part which you get a choice to see or not and which I by mistake chose to watch mainly because I thought I could perhaps have Clementine interrupt it at the last minute; instead I may have started to unlock her darker side (one of the themes that is explored in this episode). What is also interesting is seeing how Carlos's daughter, Sarah deals with the real world having been mostly sheltered from its cruelty and harshness until now. For those that have played The Walking Dead: Season One, you know the drill. Gameplay is pretty light, with simple puzzles and the game feels more like a visual novel. The game is mainly conversation driven and focuses more on your relationships with characters more than anything else. You'll occasionally have some Quick Time Events (QTEs) during action sequences but that's about it. Voice acting is great but that's to be expected from veteran voice actors – the only issue I had was that the audio was sometimes too loud or too soft. The game has a suitably atmospheric music soundtrack; while there are no memorable themes it is effective in setting the sombre, depressing mood to the game. The graphics are similar to The Walking Dead Season One (as you'd expect) and are the best I've seen in a Telltale game yet adopting a thick edges, comic-book style (a similar style is adopted in The Wolf Among Us). The only thing that annoyed me was the fact the framerate tended to jump all over the place at times. Just like Season One, the ending you receive depends on the choices you make in the game, so there is some attraction there to replay the episode (and indeed, the whole game once it is released). Also like Season One, achievements are still very easy to acquire (i.e. proceed to a certain point in the story) and there's not enough variety to encourage multiple playthroughs. I had to give the episode a slightly lower score on replay though as it was a bit shorter than expected - although it seems all Telltale games are heading this way. Unfortunately, as it's a Telltale game, it uses the most recent Telltale Tool so the interface is a very console-friendly one, not a simple point ‘n' click adventure. The game also has the annoying Type 1 save system where progress is autosaved but you never know when the next save point is. If you like your Walking Dead episodes dark, this is the darkest one I've played yet with some pretty confronting scenes in store for the player. If only the episode wasn't so short.